A famous economics essay features a pencil (yes, a pencil) arguing that “not a single person on the face of this earth knows how to make me.” Is the pencil just bragging? In any case, what can the pencil teach us about our global interdependence — and the proper role of government in the economy? ANNE TRUBEK: Handwriting’s going away. Anne Trubek studies the history of handwriting and handwriting technology. In a world that is increasingly digital, Trubek argues, teaching handwriting in schools is time poorly spent. TRUBEK: I think it will continue to diminish in elementary education. It will continue to diminish in our everyday lives, as it has already. And as handwriting diminishes, so does our need for writing instruments. TRUBEK: The numbers of examples of things that you still need to be able to use a pen or pencil and paper in the ordinary course of a work day — it’s shrinking. Indeed, the market-research firm Euromonitor International has found that, in the U.S., at least, the sales of writing instruments has had five years of consecutive decline, with a forecast for more of the same. That said, sales of pens have been rising slightly. It’s the pencil that is fading in the bright light of the digital age. CAROLINE WEAVER: We sell only pencils. New pencils, rare pencils, antique pencils, novelty pencils, pencil accessories. Caroline Weaver is the proprietor of CW Pencil Enterprise. WEAVER: I grew up in Marietta, Ohio, which is in the southeast corner of Ohio, just across the river from West Virginia. Weaver is only 25 years old, which is young to be the proprietor of any shop, much less a pencil shop. But then, after you speak with her a bit, it’s hard to imagine Weaver doing anything else. WEAVER: It was just kind of a lifelong obsession. On the inside of her left forearm is a pencil tattoo. WEAVER: My mother drew it for me. I asked her to take a black Ticonderoga, sharpen it three times and draw it to scale. And that’s what she did. And you can surely guess what Weaver and a friend dressed up as for Halloween. WEAVER: We both wore these paper pencil-point hats that we made and we wore pink shoes like an eraser and then painted whatever the logo of our pencil on our clothes. What is it about the pencil that so captured Caroline Weaver’s imagination? WEAVER: I like to make things, and I’m really interested in the way that things are made. And so at a really young age, I developed an interest in these objects that appear to be really, really simple but are actually very complicated in the nature in which they’re made, and kind of the nuances to all the parts that they’re made of. She sells American pencils. Japanese and German and British and Swiss and Indian pencils. WEAVER: Every country kind of has its own normal as far as pencils go, and often those things aren’t available outside of their home countries. DUBNER: So, talk for just a second about the economics of your shop. Is it profitable? WEAVER: Believe it or not, it is profitable. It turns out there are a lot of closet pencil nerds out there who want these things as much as I do. But let me tell you why we’re really here today. It is not just to celebrate a young entrepreneur with narrow tastes. Nor is it simply to gawk at the variety of her collection – variety in color, in country of origin, even in cost: some pencils can be had for as little as $.30; some vintage pencils go for $75 apiece. But no, that’s not why we’re here. We are here to see one particular pencil, which is so unassuming, so typical in its pencilness, that I didn’t even realize Weaver had opened a drawer and pulled out a box of them. DUBNER: Oh, this is the 482. WEAVER: That is the 482, yeah. It’s a classic Mongol. WEAVER: From roughly the 1950’s. DUBNER: Ok, so how many different pencils did Eberhard Faber make? WEAVER: Oh, probably hundreds. They were mostly known for the Mongol, and the Blackwing, and the Van Dyke, and the Microtomic. DUBNER: Was the Mongol 482 kind of the star of the line? Or no? WEAVER: I would say that the Blackwing was the star of the line but the Mongol was their, sort of like middle-range, everyday pencil. By the point that this one was made, graphite technology had advanced a little bit, and so it’s generally a much smoother pencil because that’s when they figured out that if they put wax in pencils, they were a whole lot smoother than just using graphite and clay and some sort of binder. They changed the aesthetic of it a little bit, too. The classic Mongol ferrule was black with gold band. Around that time, that’s when pencil companies kind of started developing their signature ferrule for their different pencils. PENCIL, as read by ROBERT KRULWICH: My family tree begins with what in fact is a tree, a cedar of straight grain that grows in Northern California and Oregon. It is a complex story about how a simple thing comes into being, and what a lowly pencil can teach us about solving some of the world’s hardest problems. 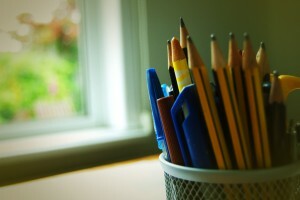 PENCIL: I am a lead pencil— the ordinary wooden pencil familiar to all boys and girls and adults who can read and write. Yes, the essay is told in the voice of the pencil. An Eberhard-Faber Mongol 482. PENCIL: You may wonder why I should write a genealogy. Which is a bit weird. But also, this pencil has a chip on its shoulder. PENCIL: Sadly, I am taken for granted by those who use me, as if I were a mere incident and without background. PENCIL: I have a profound lesson to teach. But you know what – it does have a profound lesson to teach. “I, Pencil” has become a classic in the canon of economics literature, translated into every major language. MATT RIDLEY: It’s rather beautifully written, this essay. RIDLEY: And it really struck me between the eyes because this essay is at once both extremely obvious when you think about it, and extremely revelatory. TIM HARFORD: Hello, hello. This is Tim. And that is Tim Harford, an economist. HARFORD: Sometimes known as the Undercover Economist. I write books of that title and a Financial Times column. Tim Harford and Matt Ridley are going to help us re-tell the pencil’s autobiography, which is really more of a parable. It first conveys a set of facts; then it reaches a shallow conclusion; and ultimately a deeper conclusion. PENCIL: Just as you cannot trace your family tree back very far, so is it impossible for me to name and explain all my antecedents. But I would like to suggest enough of them to impress upon you the richness and complexity of my background. While researching the essay, Leonard Read visited an Eberhard Faber pencil factory in Wilkes-Barre, Pennsylvania. What he found was a supply chain that, even in the 1950s, reached around the globe. Let’s start with the wood. PENCIL: My family tree begins with what in fact is a tree, a cedar of straight grain that grows in Northern California and Oregon. HARFORD: Think about all the processes, all the people who are involved in cutting down those trees and in machining those trees. The people who designed the chainsaws and the axes and the trucks that ship the cedar across country. PENCIL: Why, untold thousands of persons had a hand in every cup of coffee that the loggers drink! Next, the pencil tells us, the logs were shipped to a mill in San Leandro, California. RIDLEY: And there they were milled and cut into pencil-like shapes. The pencil acknowledges all the workers who built the hydroelectric dam that powers the mill. And then there’s the lead. RIDLEY: … is graphite mined from Ceylon, Sri Lanka, mixed with clay, paraffin wax, candelilla wax, and hydrogenated natural fats. Did we know that? No we didn’t. And here the pencil nods toward all the graphite miners, the men who built the ships that transport the graphite, the harbor pilots who guide those ships in from the sea. PENCIL: Even the lighthouse keepers along the way assisted in my birth. And then there’s the lacquer, the paint that gives the Mongol 482 its bright yellow color. PENCIL: My cedar receives six coats of lacquer. The lacquer is made with oil from castor beans and a load of other ingredients. PENCIL: Why, even the process by which the lacquer is made a beautiful yellow involve the skills of more persons than one can enumerate! RIDLEY: The number of people involved in creating this pencil is enormous. HARFORD: And then he goes into the same detail about the ferrule, which is the brass metal at the end of the pencil. RIDLEY: The brass on the top of the pencil, the so-called ferrule, is made from zinc and copper, which have to be mined. RIDLEY: … rapeseed oil mixed with sulfur chloride and pumice and calcium sulfide to give it color and that kind of thing. All these incredible ingredients going into this very simple object. HARFORD: The pencil explains all this detail, but in each case, the pencil is pointing out that there are these global supply chains, there are all of these different inventions going way back in history, all of these different people involved. And if you put it all together, you realize there isn’t a single person in the world who would really understand how to make a pencil from scratch, from the raw materials. PENCIL: Simple? Yet not a single person on the face of this earth knows how to make me. PENCIL: Actually, millions of human beings have had a hand in my creation, no one of whom even knows more than a very few of the others. There isn’t a single person in all these millions, including the president of the pencil company, who contributes more than a tiny, infinitesimal bit of know-how. It’s a bold claim the pencil makes – “not a single person knows how to make me.” But the claim would seem to be justified. And it’s an interesting way of looking at the world, yes? At how interdependent we are, at how specialized we are. The deeper conclusion that Leonard Read was making, however – this is where things get really interesting. MILTON FRIEDMAN: The miracle of this pencil isn’t that nobody knows how to make it. The miracle of the pencil is: how did it get made? FRIEDMAN: This is the only prop I have for this TV show. As you can see it’s a plain yellow pencil. The “miracle” that allows for the pencil to be made, Friedman says, is the price mechanism that lets buyers meet sellers, and which makes free markets flow freely. FRIEDMAN: I am trading with thousands of people all over the world. Not one of them has been forced to do it. Nobody has had a gun to his head. They’ve all done it. Why? Because each one of them thinks he’s better off in this transaction. PENCIL: The absence of a mastermind, of anyone dictating or forcibly directing these countless actions which bring me into being. In other words, none of the millions of people involved, directly or indirectly in making a pencil, cared one bit about making a pencil, maybe they didn’t even know what they were making. RIDLEY: Not one of them is motivated by making a pencil. They’re motivated by earning money, providing for their family. And the astounding thing, as Leonard Read says, is the absence of a mastermind. There is no one dictating or forcibly directing these countless actions, as he put it. So the deeper conclusion of “I, Pencil” is that a well-oiled free market can create something that even an alchemist wouldn’t dream of. Now, this may not be the way you see free-market capitalism. And let’s be honest: there are market failures; there are segments of the economy that seem to be stacked against small players, or are too susceptible to self-dealing or corruption. But the point is that free-market capitalism is better than all the known alternatives. PENCIL: If you can become aware of the miraculousness which I symbolize, you can help save the freedom mankind is so unhappily losing. PENCIL: Leave all creative energies uninhibited. Merely organize society to act in harmony with this lesson. Let society’s legal apparatus remove all obstacles the best it can. Permit these creative know-hows freely to flow. Have faith that free men and women will respond to the Invisible Hand. Does Read’s essay sound like Libertarian propaganda? Of course it does; that’s what it was, to some degree. So if you don’t lean that way, you may not buy its message. There’s also an argument to be made — as some people have made — that the pencil conveniently omitted some important facts from its autobiography. Like: all the goods and services the government provides that help, directly or indirectly, in the pencil’s manufacture and sale; the roads that move the lumber and other materials; the public schools that educated the loggers and the mill workers; the same schools that — at least in 1958 — would have ordered thousands upon thousands of pencils for their students. HARFORD: Clearly, in a modern economy, a tremendous amount of the infrastructure that we rely on has been paid for by taxpayers and coordinated in some way by state government, local government, or by the federal government. Some of these things could be provided privately. But, as a matter of fact, they are provided by government and they seem to be provided reasonably well. HARFORD: … I think that’s an extreme reading. It’s not impossible to read it that way, but you’re really pushing it. If your reading, however, is the free market can do a lot, it does amazing things, and government should be careful before it sort of stamps its great big boots all over a free-market process, I think that’s a fair reading and I think that’s a wise warning. It is a warning that Harford says is worth heeding. Especially as we are collectively thinking about how to deal with things like climate change, income inequality, the stability of our financial system. HARFORD: So, there are all kinds of areas of the global economy where you could say, “I’m not happy with what the free market is giving me.” The lesson I draw from the story of “I, Pencil” is: when you try to fix those problems, be humble. Be careful. Because they’re far more complicated than you could possibly imagine. And any fix to, for example, the energy system, is going to involve far more people and far more countries and far more technologies than you could imagine. And that doesn’t mean that you should just leave the market to do everything, but it does suggest a particular way of solving problems. And I guess in addition to requiring input from a lot of other people, because of the complexity, it also implies that you may indeed, quote, “solve” one part of the problem, but that solution may indeed ripple up and turn into a bigger problem in another realm that you may not care about, but that actually does affect a lot of people. I mean, some kind of unintended consequence, I guess, yes? HARFORD: So, yes, one lesson is that there will always be unintended consequences whenever you start messing around with a complex system. I think another lesson is that trial and error is a really important process. This is the lesson I draw in my book Adapt. You need to carry out lots of experiments and you need to create a system that allows lots of experiments. The free-market system is an experimental system, but it’s not the only experimental system. So if you’re going to start messing with global supply chains — with the energy system, with the financial system — you want to make things work better, you are going to need to do that step by step, constantly gathering data about what’s working and what’s not and running really good experiments. And I think where Leonard Read was absolutely right was to suggest that when the free market works well, it delivers amazing results. Well, why does it deliver amazing results? One reason is because there’s lots and lots of small experiments and lots and lots of small failures. There are pencil manufacturers or lumberjacks or coffee companies or truck companies making bad decisions and going bankrupt all the time. But the system as a whole is resilient and stable and creative. And, as Leonard Read rightly pointed out, it produces miracles. JIM WEISSENBORN: Okay, here we go. Jim Weissenborn. I’m a fourth-generation pencil maker and we’re in Jersey City, New Jersey, at the home of General Pencil Company. General Pencil was incorporated in the late 19th century. WEISSENBORN: We’ve been at this location since 1917. Jim Weissenborn is 77. He took over his family’s business nearly 40 years ago. General Pencil considers itself the last remaining “complete” pencil factory in the United States. WEISSENBORN: You’re going to see probably something that’s not available anyplace in the world. It’s the total production of a pencil from the very rawest materials to the finished product. We even do all our own marketing. It’s kind of fun. There are only a couple other U.S. pencil factories left, in Tennessee, but Weissenborn says they mostly assemble pencil parts made overseas. Over the last 25 years, he’s seen 17 U.S. pencil factories close. He’s bought a lot of their old machinery at auction, stored it away for spare parts for his own factory. WEISSENBORN: I’m going to take you in the way from the very beginning of the process, okay? WEISSENBORN: Be careful going down. Graphite’s slippery. Weissenborn led our producer Christopher Werth on a tour. It began by walking down a steep set of stairs into the factory’s basement, where giant metal barrels were churning up a mixture of graphite and clay. WEISSENBORN: These barrels are the secret to our product. These are tumbling barrels. They’re used in Germany 100 years ago. We’ve never changed this process. And what you hear going around in there are Belgium stones off the coast of Belgium. And they pulverize the graphite and clay into a talcum, real fine, and that’s where your pencils become smooth. That fine mixture is then dried, ground up again, mixed with water. Then it’s extruded through a machine that makes pencil leads that, at this point, look like long strands of soft, gray spaghetti. Those are then dried again and fired in kilns at around 1,800 degrees Fahrenheit. WEISSENBORN: This is the traditional way of making — if you went through a pencil factory 100 years ago in Germany, this is what you’d see. I mean, you’re in a time warp. In 1958, Leonard Read wrote that the graphite for pencil lead came from Ceylon, which is present-day Sri Lanka. Most of the graphite General Pencil uses today comes from Mexico; overall, China is the biggest supplier. What about the eraser? WEISSENBORN: Nobody makes erasers in the United States. So our erasers are made for us in Spain. The tour heads into the woodshop. A machine is cutting a row of tiny grooves into thin, rectangular wooden slats. This is how the lead gets into the pencil. A lead is laid into each of the grooves and then another grooved, wooden slat is glued on top. WEISSENBORN: These are number #2 HB leads coming down. The slats — the bonding process is the glue goes in the bottom one. They’re flipped over, make a sandwich. The wood that General Pencil uses is cedar from the mountains of California and Oregon, just like in “I, Pencil.” So some things have stayed the same, although, for a company like General Pencil, much has changed. WEISSENBORN: In the old days, 80 percent of what we made were yellow pencils. We had all the contracts for the L.A. Unified school districts, Seattle school districts, State of New York. We were running truckloads and truckloads of pencils out of here. I’d have all the kids and my wife working in here. This was back 40 years ago. WEISSENBORN: You know, romantically that’s a nice story, “no one makes a pencil.” I think we make a pencil. But Weissenborn admits: he’s never even been to a graphite mine or a clay mine. He doesn’t cut down the cedars out west. Which means Leonard Read was right, doesn’t it? PENCIL, as read by Robert Krulwich: Simple? Yet, not a single person on the face of this earth knows how to make me. Not a single person – even the owner of a “complete” pencil factory – really knows how to make an object as seemingly simple as a pencil. Not that most of us would ever want or need to do such a thing, right? That was really Leonard Read’s point – that the miracle of a well-functioning free market is that it provides us with what we want, generally speaking, at a price we can afford, at least most of the time. So a kiwifruit grown in New Zealand or Italy? I can buy that for a dollar in a New York grocery store – even an online grocery store, which delivers to my door. What do you want to buy? A German-made car? A t-shirt made in Indonesia and Bangladesh, spun from cotton grown in Mississippi? Yep, you can buy that too. But this does not stop some people from trying to make their own stuff, from the ground up. HARFORD: There is a very interesting modern parallel to Len Read’s “I, Pencil” story. That again is the economist and writer Tim Harford. HARFORD: A few years ago, a London design student called Thomas Thwaites decided that he was going to build a toaster from scratch. THWAITES: You know, mundane electric toaster. And that is Thomas Thwaites. He wanted to better understand just how finished consumer goods get to him. THWAITES: So I went and bought the cheapest toaster I could find, ’cause I thought the cheapest toaster would be the simplest to reverse-engineer. HARFORD: And this toaster costs about 5 or 6 dollars at the local store. So it’s a simple, everyday product. We British, we love our toast. Thwaites took home the toaster, and took it apart. THWAITES: And to my dismay there were kind of 400 individual bits that had been made and then come together into this item whose sole purpose was to make toasting a slice of bread slightly more convenient in the morning. DUBNER: Those 400 individual bits were made of many different materials. HARFORD: There’s copper, there’s nickel, there’s plastic, which is really important, because it makes the toaster look good and also means you don’t get electrocuted. There’s mica, which is a sort of slate-like material and that’s what you wrap the heating elements around. THWAITES: All these different, specialized materials. And I was like, “Oh God, I’m trying to replicate this entirely myself. Where do I start?” So, my strategy became to simplify and substitute and pare back to five materials that I thought I could manage and would give me the best toaster I could make. Those five materials were steel, nickel, copper, mica and plastic. But even with the first material, steel, Thwaites hit a roadblock. The steel-making process is incredibly difficult, especially for an art-and-design student. So he settled on iron, which is somewhat less complicated. HARFORD: It turns out Britain is a post-industrial society. We don’t have any iron mines anymore but we have a disused iron mine. Thwaites called up an old iron mine in Wales that had been turned into a museum. THWAITES: And said, “Oh, hi, I’m trying to make a toaster.” And the guy on the other end of the phone was like, “Yeah, sure, come down.” So I jumped on the train and went to Wales to this iron mine. HARFORD: Turns out when he got there they had misunderstood him on the phone. They thought he had said, “I’m a design student and I’m trying to make a poster.” Which I think makes a lot more sense. But anyway, they cleared that up and he went back home with a suitcase full of iron ore.
THWAITES: I literally brought an empty suitcase with me—and filled it up with iron ore.
HARFORD: But then once you’ve got iron ore, what do you do with that? How do you turn iron ore into iron? THWAITES: Good question. Yeah, it’s like fundamental, isn’t it? How do you make metal from rock? I had a vague idea — you have to get it hot. Turns out, it’s a little more complex than that. Thwaites consulted professors and some books on metallurgy. He landed on a method from the 15th century, with a few modifications. HARFORD: He got a big trash can, he got a leaf blower, he got barbecue coals, and so he created this backyard furnace. There’s a video — just search for “Thwaites,” and “toaster project” — and the video shows flames pouring out of the trash can. The fire produced a big lump of heavy gray matter that looked like metal. Alas, Thwaites was not quite as genius as he imagined. The lump was still just iron ore. So he read some more and landed on another idea. THWAITES: Hmmm. What about a microwave? He found a patented process for smelting iron in a microwave oven. THWAITES: My mum had a microwave so I went round to her house and kind of borrowed it. “Kind of borrowed” because his mother’s microwave, in fact, exploded. HARFORD: But the second one survived and he managed to get iron. DUBNER I love that in the service of making a toaster, he destroys at least one microwave along the way. HARFORD: He destroys a microwave, and he has to go through a lot of shortcuts in order to get the toaster. With the nickel he needed, for example. Thwaites couldn’t find any old nickel-mine-turned-museum in Britain. The closest extant mine he could find was in Siberia. THWAITES: So in the end I had to — even though they had a picture of the Queen on them, which makes it illegal — I had to melt down some Canadian commemorative nickels to get my nickel. Thwaites also finally managed to get hold of some copper and mica. But he still needed plastic. Instead, Thwaites turned to a less-raw source of plastic: household waste on the streets of London. THWAITES: You know, a plastic baby toy or chair or broken plastic tub. I mean it’s everywhere so it wasn’t difficult to find. THWAITES: Put them in a bucket, floating in oil, like a kind of bain-marie for plastic recycling. It was kind of a horrible process; it was smelly, and I worry about my lungs in the future, ’cause there were this fumes coming off this stuff… you know, God knows what additives had in it. But it worked. And in the end, Thomas Thwaites had something that sort of resembled a toaster. THWAITES: To me, it looks kind of beautiful, but other people have said it looks like a weird, melted caveman toaster. An art gallery in Rotterdam invited Thwaites to show off his toaster and to try it out. That’s when he plugged it in. THWAITES: Big demo. Put my bread in, switched it on, and for like a beautiful moment, this thing was glowing red. It nearly brought a tear to my eye. HARFORD: And the toaster immediately caught fire, which he described as a partial success. THWAITES: I got my bread out and I think I’d be lying if I said it had changed to toast. It was slightly warm. THWAITES: Uh, I think I spent 1,300 pounds on my toaster in the end, yeah. That’s a bit less than 1,900 U.S. dollars, as we speak. And he had to cheat quite a bit along the way: the leaf blower, the Canadian nickels, the train from London to Wales. THWAITES: You know, I was trying to make this toaster from scratch, and that brought up the question of: what is from scratch? Because if I was really going to be making this toaster from scratch, I would have to go to the middle of the woods, get rid of all my worldly belongings and burn my clothes, and that would be starting from scratch, starting from naked in the woods. And then the process would begin of making this toaster. But that was impossible. I would have just died. THWAITES: I guess I was actually re-creating “I, Pencil” in a way, but just with a toaster. I could have picked a pencil, I think, and had equally as difficult a time. THWAITES: Trying to do these processes and failing so often really made me think, it’s just been this incremental process of slight improvements, lifetimes and lifetimes of building this pyramid of knowledge and techniques. Tim Harford, as an economist who himself lives near London, a most global city, he understands how any one of us might feel alienated by this pyramid — the big, complicated global processes — that produce the pencil or the toaster that show in up a local shop. HARFORD: But of course you could also take Len Read’s perspective — the more pro-free-market perspective — and say, “Hey, look, you can have a toaster, it’ll cost you $5 or $6. It works really well. All you need to do is trust the market.” The market will bring all of these things together, there doesn’t need to be anybody in charge. Nobody needs to understand it. It will get you your toaster. Let me ask you one more question. If you, Tim Harford, wanted to take up the Thomas Thwaites challenge or something like it and go into the forest naked and create something from scratch, anything, what do you think you could pull off? HARFORD: I would be absolutely finished. If I could light a fire, if I could just light a fire, I’d be delighted. DUBNER: So you think you’d starve and be eaten to death by squirrels and that’s the end of your line? HARFORD: I think eaten by squirrels would be a mercy. If I could be quickly eaten by squirrels, I would count myself lucky. Next time on the program: it’s open-mic night. We hear how Freakonomics Radio listeners have used the show to make some kind of change or difference in the world. From donating a kidney to remaking the classroom and lots more of your stories. Your ability to win any game you play with friends and family? Would you like to improve your productivity? Would you most like to improve your sticktuitiveness or grit? Would you most like to improve your ability to become an “expert performer” in a sport, at a musical instrument, or some other difficult pursuit? You can use your phone to make a short audio recording — just use whatever voice memo app is on your phone — and email us the file, at radio@freakonomics.com. Please include your name, where you live, what you do, and, most important, what you most want to improve in yourself, and why. Thanks. Freakonomics Radio is produced by WNYC Studios and Dubner Productions. Today’s episode was produced by Christopher Werth. The rest of our staff includes Arwa Gunja, Jay Cowit, Merritt Jacob, Greg Rosalsky, Kasia Mychajlowycz, Alison Hockenberry and Caroline English. Big thanks also to Robert Krulwich of Radiolab for giving voice to Leonard Read’s essay; he sounds just like I always imagined a Mongol 482 pencil would sound. You can find all our previous episodes here on our website; you can also subscribe to the podcast on iTunes or wherever else you get your podcasts and you can also find us on Twitter and Facebook. “I, Pencil: My Family Tree as told to Leonard E. Read” by Leonard Read, Foundation for Economic Education (1958). Pencil Heist: box of rare Mongol 482 pencils stolen from artist Damien Hirst. *In the original transcript, we stated erroneously that Milton Friedman’s public-TV series called Free to Choose was based on his book of the same name. In fact, the TV series preceded the book.